Scott Lobdell has been one of the DC Comics New 52's most controversial writers, whether for minor infractions (continuity revisions within the New 52's own Teen Titans) or major (Red Hood and the Outlaws's Starfire kerfuffle). Less has been said about about Lobdell's Superboy (collected in Superboy: Incubation), perhaps because it's just plain good -- a story, as Superboy ought be, of misguided teenagers flailing about, trying to do the right thing, not always succeeding but giving it their best effort. Fans of the Young Justice cartoon, especially, ought be satisfied with this one. The reader might feel an amount of fully-justified whiplash following Superboy around the events of Incubation. He is a prisoner of the mad-science organization NOWHERE, he's their weapon, he's abandoned them, he's rejoined them, he's attacking them. Such is the struggle for identity that Lobdell presents through Superboy -- cloned and born fully-grown, Superboy rebels against the only parents he's ever known, even as he continues to return to them for direction and validation. Along the way, Superboy also struggles with the heroic ideal -- he does not save every endangered person he encounters, refusing to blindly accept the "Super" in his makeup. Superboy is a narration-heavy book, likely to a fault -- a comic that's all action is equally bad, but at one point, when Superboy considers his life while floating before the Rockefeller Center Christmas tree, Lobdell packs twenty thought boxes into two pages. All of this thinking, however, serves well the Stranger in a Strange Land aesthetic of the book -- Superboy analyzes everything, ad nauseum, in part because he's truly conflicted about what he believes and who he wants to be. Lobdell takes the time in Incubation to truly get into Superboy's head, and it's appreciated. There's nary an appearance by Superman in this book, but the new Supergirl stops by to knock Superboy around a bit. 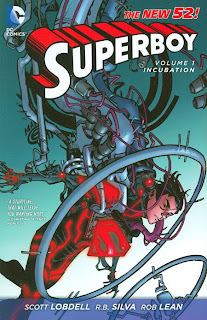 Incubation's release is poorly-timed (it takes place after events in both the first Supergirl and Superman collections, despite that they won't be released for a few months), but Lobdell deals with the new continuity well and succeeds in making Supergirl likable despite that she's generally angry and arrogant. Neither the new Superboy nor the new Supergirl fit in -- she knows too much, aware of what destroyed Krypton and frustrated no one on Earth will take her seriously; and he knows too little, pushed around by NOWHERE and now determined to resist all authority. They are, the reader must admit, a pleasant change from the clean cut, super-mentored, toe-the-line Super-family of the old DC Universe, and it'll be thrilling when they finally do interact with the Man of Steel himself. Those who followed the "old" cloned Superboy from the beginning can't feel that they're missing much. Sure there's no Tana Moon or Newsboy Legion, and Superboy's not off to Hawaii with Dubblex, but Lobdell's still got the tactile telekinesis, and even finds a creative way to give Superboy his Kryptonian name Kon-El. (An especially nice touch is that Superboy has to be concentrating to use his telekinesis, such that a sneak attack can still harm him.) There's also varied items that evoke the Jack Kirby influences from Karl Kesel's Superboy series -- Superboy fights some beasts reminiscent of Kamandi's sentient animals and also a fiery woman resembling the animated DC Universe's Volcana, herself based on Kirby's Victor Volcanum (who also fought Kesel's Superboy); NOWHERE's Centerhall's relationship with the new Superboy echoes that of the old Superboy's relationship with Project Cadmus's Guardian. Certainly on purpose, Superboy's origins and demeanor mimic the same on the Young Justice cartoon. But even more compelling than Superboy in this volume is Lodbell's use of Caitlyn Fairchild and Rose Wilson. The surprise of former-Wildstorm character Fairchild's appearance her is long since spoiled, but it makes hints at thirteen super-powered characters no less fun. DC hasn't pulled the trigger on a Gen13 book yet, and perhaps with the spin-off series The Ravagers they don't have to; Fairchild's integration into Superboy and the DC Universe here is seamless, preserving old, likable elements of the character while giving her new purpose. The new Rose Wilson also combines the best of old and new; Lobdell makes her both tough and sympathetic -- at times more sympathetic than Superboy, especially in her concern for Fairchild -- such that the audience again feels they've gained more than they've lost. R. B. Silva's pencils mesh perfectly with the story Lobdell tells; Silva's sparse lines are cartoony while still realistic -- maybe the only problem are instances where Superboy, shown in head and shoulders, resembles Klarion the Witch Boy. Shane Davis's covers are a coup for the series (even though it's a Super-title, Superboy isn't that high-profile), kind of like Resurrection Man getting Ivan Reis covers. Writer Jeff Lemire is certainly no slouch, but his last pre-Flashpoint Superboy series saw Kon-El chasing undead farmers with his high school friends. The whiz-bang sci-fi of Superboy: Incubation, in contrast, does feel fresh and new -- and especially the idea that the new Superboy doesn't automatically have Superman and the entire Justice League always ready to get him out of trouble. Scott Lodbell's more controversial works are still to come, but to read Superboy on its own, there's no cause for concern so far. Wednesday (also known as Halloween), go out and get your copy of Superman: Earth One, Volume 2. Read it. Then come back here Thursday, because we're going to have a lot to talk about. See you then! I read the first issue of this series but didn't around to others. I guess of all the changes in the New 52, it's Superboy's new Tron costume that bothers me the most. From that issue it was easy to see that Lobdell understood Superboy, but that costume is terrible. I will hopefully get around that hangup, because your review of this collection affirmed what I'd hoped. The costume didn't bother me but I never necessarily made the Tron connection. It does look like Superboy may be in for a costume change, though, in Lodbell's upcoming Super-title crossover. Or so the rumor goes. I picked up the first issue. I thought it was solid, despite the many MANY MANY narrative boxes. But I wasn't moved or convinced to continue after that. RB Silva is great. I love his clean style. After reading your review, I might consider this weekend to pick up the trade. @Jules, I hear you on the wait for Teen Titans, but at least it was only a month; the wait between the Animal Man and Swamp Thing trades was like four or five months! It's useful to have Superboy around when you're reading Titans, though; Superboy #7 takes place before Titans #7, and from the perspective of the Titans book the action jumps strangely if you're not reading Superboy too.